RI President-elect Sakuji Tanaka announces the 2012-13 RI theme during the International Assembly in San Diego, California. RI President-elect Sakuji Tanaka unveiled the 2012-13 RI theme, Peace Through Service, during the opening plenary session of the 2012 International Assembly, a training event for incoming Rotary district governors. 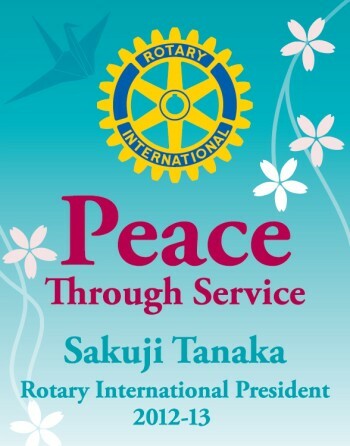 RI President-elect Sakuji Tanaka will ask Rotarians to build Peace Through Service in 2012-13. 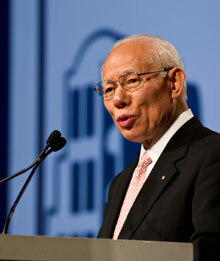 Tanaka unveiled the RI theme during the opening plenary session of the 2012 International Assembly, a training event for incoming Rotary district governors. "Peace, in all of the ways that we can understand it, is a real goal and a realistic goal for Rotary," he said. "Peace is not something that can only be achieved through agreements, by governments, or through heroic struggles. It is something that we can find and that we can achieve, every day and in many simple ways." Peace has different meanings for different people, Tanaka said. "No definition is right, and no definition is wrong," he said. "However we use the word, this is what peace means for us. "No matter how we use, or understand the word, Rotary can help us to achieve it," he added. Tanaka, a businessman from the greater Tokyo metropolitan area, shared how becoming a Rotarian broadened his understanding of the world. After joining the Rotary Club of Yashio, in 1975, he said, he began to realize that his life's purpose was not to make more money, but to be useful to other people. "I realized that by helping others, even in the simplest of ways, I could help to build peace," Tanaka said. He noted that the Japanese tradition of putting the needs of society above the needs of the individual helped his country rebuild after the tsunami and earthquake in March. "This is a lesson that I think the whole world can learn from, in a positive way. When we see the needs of others as more important than our own needs -- when we focus our energies on a shared goal that is for the good of all -- this changes everything," he said. "It changes our priorities in a completely fundamental way. And it changes how we understand the idea of peace." Tanaka will ask Rotarians to focus their energy on supporting the three priorities of the RI Strategic Plan, he said. He added that he will ask the incoming leaders to promote three Rotary peace forums, to be held in Hiroshima, Japan; Berlin; and Honolulu, Hawaii, USA.